I’m not a registered Republican. For that matter I’m not a registered Democrat either. In fact, I’m not a registered member of any party. I think California currently calls people like me “no party preference.” It used to be “declines to state.” I like the sound of that one better. Chances are pretty good that I’ll vote for the Democratic presidential candidate this year. It’s not that I have a warm or even tepid regard for the Democratic candidates. It’s because of the Republican candidates. Most GOP presidential candidates are just repellent. This year, the two leading Republican hopefuls appeal to the side of human nature that’s usually the raw material of sensationally brutal and senseless crimes. What we’ve got here, folks, is a sociopath and a guy with borderline personality disorder. The sociopath, Cruz, is what they call in crime fiction an organized offender while the BPD guy, Trump, is a disorganized offender. If either of these guys wins the presidential election we’re doomed or, even worse, doomded. The good news is that, at least according to current polls, neither stands a chance against a Democrat who can walk, talk, and doesn’t drool too much. Naturally I’d like the less likely winner to run. I think Big D is my man. I’m backing him, at least in the fight for the nomination, 101%. I’d like to go 110% but that’s impossible since 100% is an absolute maximum. I think the extra 1% is within sampling error so I’m sticking with it. I urge all like minded citizens to follow my example. This reporter went to seven convenience stores selected at random from the internet and bought a 40 oz. bottle of malt liquor at each. All of the clerks pronounced the letter “O” in the distinctive Canadian manner and ended many sentences with a rising inflection and the word “eh.” Several of them wore plaid flannel shirts. Clerks were observed with copies of Kant’s “Critique of Pure Reason” and Spenser’s “Faerie Queen.” One was scribbling arcane mathematical equations in a spiral notebook. None of them would comment on their national origin. All of the stores had large amounts of hockey paraphernalia on display. Moryn advised that anyone who suspects that Canadian illegals are living in their town to contact ICE. He promised that every complaint would receive the agency’s full attention. In this second installment of our series on the influx of illegal Canadian immigrants with PhDs we’ll take a look at some of the sociological consequences of the invasion from the north. Last week I interviewed Dr. Jerome Herman Dean, a senior fellow at the Rickey Institute of Social Behavior in St. Louis. Dr. Dean specializes in the dynamics of crowds. He recently published a monograph titled “New Trends in Group Behavior” in the Midwest Journal of Social Dynamics. JF: I understand your monograph has caused quite a stir both in the academic community and among the general public. Could you describe your findings? JHD: Over the last three years my research staff has monitored behavior in a variety of public places. They’ve noticed an odd shift in the dynamics of these situations. The incidence of fights among the spectators at hockey games has declined by 60% from 2004 levels. Customers at dawn Christmas sales have formed orderly lines and entered the store at a walk, one at a time when the doors opened. There has been a 25% increase in the use of turn signals. The incidence of people giving up seats to the aged and infirm on public transit has increased by 75%. JF: Do you believe this indicates a trend? JHD: Yes. For the last fifteen years we have studied the behavior of crowds in four areas: driving, entertainment events, shopping, and public transit. We’ve developed objective measures of crowd behavior. We’ve established a particularly useful metric which we call the “Rudeness Index.” In each of the four areas we’ve found a statistically significant decline in rudness since 2004. Furthermore the Rudeness Index shows a decline every year versus the previous year. JF: Have you identified a cause for this shift in behavior? JHD: Our current results show a strong positive correlation between the increase in the population of Canadian illegal immigrants with PhDs. The decline in the Rudeness Index since 2004 has tracked the increase in the Canadian illegal PhD population very closely. We’re now working on several studies to test our findings. JF: So you’re not sure that the Canadian Invasion is responsible for the changes you’ve noticed. JHD: This is science; everything is open to question. I believe in the soundness of our methodology and the statistical analysis of our results. So, yes, I believe that the increase in the number of Canadian PhDs who entered this country illegally is, given the current level of knowledge, the best explanation we have for the decline in rudeness. My colleagues in the profession are in accord with me. Bukka White called Memphis Minnie “about the best thing goin’ in the woman line.” In the 1930s and ’40s she was one of the top blues recording artists. A powerful singer and skilled songwriter who played guitar better than most of her male contemporaries, she recorded over 180 songs, most of which she wrote, between 1929 and 1959. Musicians who appeared on her records included Big Bill Broonzy and Little Walter. Her songs were covered by a wide variety of musicians including Bob Wills, Led Zeppelin, and the Jefferson Airplane. Memphis Minnie was born Lizzie Douglas in Algiers, Louisiana on June 3, 1897. 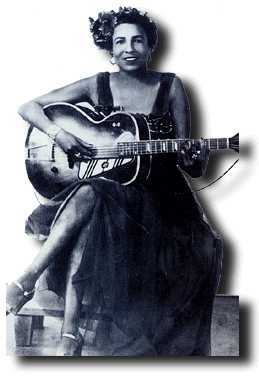 Her family called her “Kid.” In 1930 a record company A & R man named her Memphis Minnie. In 1904 her family moved to Walls, Mississippi, a few miles south of Memphis. Her first guitar was a Christmas present when she was 8. She attended school long enough to pick up the rudiments of reading, writing and arithmetic. In her teens she ran away to Memphis numerous times, coming home when she ran out of money. During WWI she joined a Ringling Brothers show that toured the south. From that point she was on her own as an entertainer. After leaving Brown she moved to Memphis and started working with Joe McCoy. In 1929 they were signed by a Columbia Records scout who heard them playing for tips in a barbershop. They recorded eight songs in New York including “When the Levee Breaks” and “Bumble Bee,” a song she was to record five times. 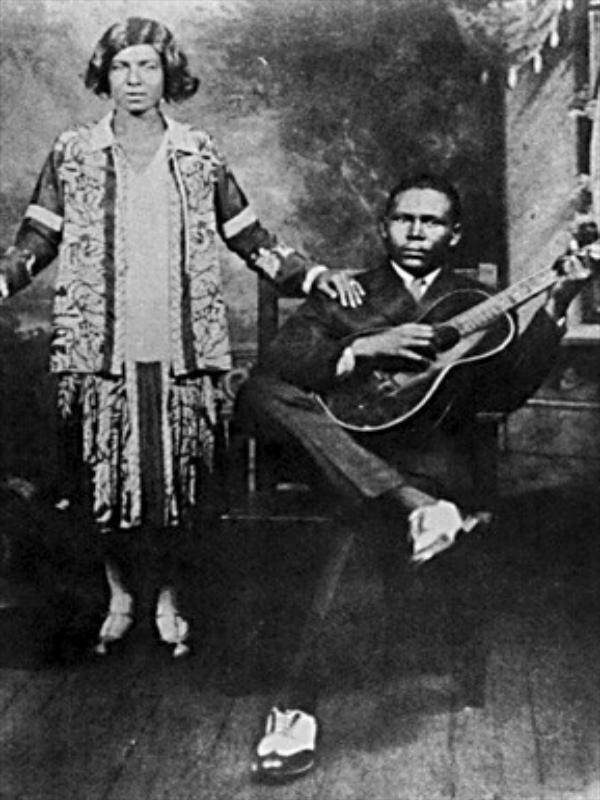 The record company released the records under the names Kansas Joe and Memphis Minnie. The records did well. She dropped Kid Douglas in favor of Memphis Minnie. It was the beginning of 20 years of blues stardom for her. She and McCoy settled in Chicago shortly after their records came out. They recorded frequently and played clubs in Chicago as well as the South and Midwest. Their sound was based on intricate guitar duets that combined a rural feel with sophisticated interplay. She played lead while McCoy played a bass line. Her vocals were simple and straight forward with an air of power and self assurance. Many of their songs had rural themes like Plymouth Rock Blues, a song about chickens, and Frankie Jean, a song that showed how to call a horse. What’s the Matter with the Mill combines sexual innuendo with a farmer’s regular trips to the grist mill. They recorded many double entendre songs with titles like My Butcher Man . Daily life was the theme for songs like North Memphis Blues, a commercial for a restaurant called the North Memphis Cafe and Memphis Minnie-jitis Blues, a song about a bout with meningitis that’s notable for its stark, elegant language. Her biggest hit from this part of her career was Bumble Bee, which she recorded several times. It celebrated lust in a way that transcended the double entendre material she recorded so often. “I got a bumble bee, don’t sting nobody but me… ” she sang. In the second version she recorded, she sang “He had me to the place once that I wish to God that I could die.” The lyrics to each version of the song are markedly different. Minnie and Joe McCoy split in 1935. Their last recording was a two sided duet called You’ve Got to Move on side one and You Ain’t Got to Move on side two. Joe did have to move. In the mid ’30s Minnie’s style took on a more urban flavor. For the next four years or so she usually recorded with a piano player, often Big Bill Broonzy’s frequent accompanist, Black Bob, to complement her guitar. During this period she began playing the electric guitar. Other blues players in Chicago like Big Bill Broonzy and Tampa Red started using amplification too. It was not a revolutionary development. At the time people used the electric guitar because it helped them be heard in noisy clubs. Record company publicity pictures from around 1940 show her with an electrified National arch top guitar. She and Lawlars continued to record into the early fifties. Their last release came in 1953. In a 1952 session for Chess they were assisted by Little Walter on a remake of Me and My Chauffeur. While they recorded less frequently than in the previous two decades, they were a popular live act in Chicago in the early ’50s, working at well known spots like the Club de Lisa, Sylvio’s, Gatewood’s Tavern, and others. By the middle of the decade club work their fell off as the electric music she pioneered with Big Bill and a few others in the early ’40s matured and supplanted the music of the older artists. In 1958 she moved back to Memphis with Lawlars. In Memphis they played music as long as their health allowed. They appeared on local radio with Sonny Boy Williamson and Robert Nighthawk and worked in local clubs. In 1959 they recorded an unreleased three song test for a local label. In 1960 Minnie had a stroke that put her in a wheelchair for the rest of her life. Lawlars died in 1961. Minnie had a second stroke soon after. She spent the remainder of her life in a nursing home. She died in 1973 and was buried in Walls, Mississippi. The best bang for the buck is the two 4 disc box sets on JSP, Queen of Country Blues 1929-1937 and Queen of the Delta Blues, Vol. 2. Both are available at all of the usual on line CD sources for around $25. Her entire recorded output is available on mp3 from your favorite download site. Today Jerry Sandusky, erstwhile Penn State football coach and youth leader, received a 30 to 60 year sentence after his conviction for child molestation. Judge John Cleland, not to be confused with the author of Fanny Hill, handed down the sentence. We reached out to the Romney campaign for comment but, as of press time, has not received a response. Apple is rumored to have ordered 10 million displays for the probably not vaporous iPad Mini. It could be in stores as early as November 2. While the Pixie Dust Storm surrounding the pint sized tablet approaches category 5, industry analysts are beginning to talk about other iPads that may find their way to Holiday stockings this December. Sources at the Cupertino Fortress of Solitude who spoke only on condition of anonymity say that shortly after the pico tablet appears, the Maleficent Malic Empire will release a line of novelty iPads as an homage to Steve Wozniak, the inventor of the Apple I computer. Wozniak, before he hooked up with super salesman Steve Jobs, tried other ventures including a Polish Joke of the Day phone number. (Seriously, you could look it up.) This line’s theme will be based on the Woz’s sense of humor and will emulate some of his favorite childhood toys. Leading the pack will be the iPad Squirt. This little content consumption device will feature a bit of content creation. The Woz loved his squirt flower. The Squirt comes with a 100 ml tank and an ultra low energy consumption pump that reportedly will reduce the battery life over the standard model by only a few seconds per charge. It will be able to use most any fluid from distilled water to ultra high or ultra low pH solutions of powerful acids or bases. With an extra cost attachment it will be able to deliver sour milk without clogging the nozzle or the internal plumbing. It will come in a less expensive rear nozzle model for those who want to squirt their friends and the top of the line front and rear nozzle model that allows nerds to lend their iPad to unsuspecting friends and co-workers who’ll get a little surprise. Also slated for pre-Holiday release is the iPad Whoopee. No, it’s not that kind of whoopee. It’s a high tech version of the famous red rubber cushion kids and Shriners have placed on the chairs of unsuspecting victims for what seems like thousands of years. It will come in two models, the Sound and the Sound ‘n’ Scent. The sound model will allow the user the choice of ten prerecorded lifelike sound effects as well as the ability to create his or her own using Garage Band. New sound effects will be available on iTunes. The Sound ‘n’ Scent model will give nerds the option of delivering chemical sprays. It will come with a hydrogen sulfide and lactic acid cartridge. Reportedly butyric acid and ethyl mercaptan will hit the market soon. The third member of the Novelty Group will be the iPad Chunk. It will mimic the time honored plastic vomit pool beloved by kids the world over. The case will have an irregular simulated vomitus theme which will continue on the nauseatingly realistic Iris display screen saver. No one will sit on your chunk if you leave it on your chair. Again, two models will be available, the Sight and the Scent. Release of the more expensive Scent has been delayed by butyric acid supply chain problems. If the Chunk takes off, by next spring the Klowns of Kupertino may release the iPad Poo. The name says it all. The final member of the Novelty Group is the iPad Joy. It features a small, energy efficient, low amperage generator that will deliver 10KV. Not only will it deter theft, but it will provide hours of fun for nerds everywhere. The question “Wanna try my iPad?” could be a laff riot for geeks. Old time mini/mainframe users will be delighted to find that the Joy will include an Increase_Keyboard_Voltage utility. Recently delegates put in some serious overtime at the Democratic Convention. It was 4:15 AM EDT before presidential candidate and current incumbent Barack Obama finally got a majority on the ninth ballot. It was much more exciting than any convention since the 1920s. The delegates finally went home at 8:30 AM after selecting Joe Biden as the vice presidential candidate by acclimation and hearing Obama’s two hour and thirty minute acceptance speech. On the first ballot none of the three presidential hopefuls managed to get a majority. Obama, Lyndon Johnson, the sprightly zombie, and Barney Frank finished in a virtual tie. After the sixth ballot Johnson dropped out when it was clear that Frank was developing a commanding lead. Johnson delighted onlookers by releasing his delegates to vote their conscience. It took three more ballots for Obama to grind out a narrow victory with 51% of the delegates voting for him. Frank was gracious in defeat and promised to campaign vigorously for Obama. Sam Rayburn and Hale Boggs of the Johnson camp spoke for LBJ, announcing that he was going to endorse Obama. Johnson needed to leave the arena to harvest some cerebral tissue. His staff, taken by surprise by the number of ballots, hadn’t stocked the meat locker sufficiently. We can cut the deficit to nothing in ten years or fewer by unleashing the American entrepreneurial spirit and taxing the resulting businesses at a moderate rate. As a bit of lagniappe, we’ll be able to revitalize America’s inner cities by taking away the gangs’ raison d’etre. I expect that the most egregiously offensive instances of gangsta rap will become historical curiosities as inner city youth finds gainful employment in what we’re calling the “Service Revolution. Recently Apple won a billion dollar plus judgment in its suit against Samsung about patent infringement on smart phones and tablets. I’m not an intellectual property attorney so I can’t offer an expert opinion on the law in this case. I’m more concerned with the idea of software patents in general. Patents come from an era when technological advances were mechanical, electrical, electronic… Although there are some examples of patents being granted for some questionable things, patents of this sort generally do cover a new way of doing something that either couldn’t be done before or is so much better than existing ways of doing it that it’s an obvious departure from what the law calls “prior art.” It’s not enough to have an idea. You have to develop a concrete technique to implement the idea. Software patents don’t seem to have to meet this criterion. Software is different. Anyone with a programming or computer science background can tell you about a few things that are unique advances. The one almost all programming students learn about is the quick sort. It’s a way of sorting stuff that’s not intuitively obvious and is very efficient. In fact it’s not easy for many students to understand without spending a fair amount of time studying it. Tony Hoare, the inventor, was a student when he came up with the idea back in 1960. He either decided not to patent it or didn’t think of patenting it. There are other algorithms, recipes for performing computing tasks, that are the result of original ideas. Most of them are in the public domain. IBM was probably to first company to patent software on a large scale. It is still one of the biggest software patent owners in the world. Most big software companies own a lot of patents, which are either things developed by their own employees or existing patents that they bought. There are also companies called “patent trolls” who exist solely to buy software patents and sue companies that might infringe on their patents. A lot of the Apple vs. Samsung suit relates to “look and feel,” meaning how programs look on the screen and interact with the user. In the 1990s Lotus sued Borland over Borland’s spreadsheet software that looked a lot like then market leader Lotus 1-2-3. Lotus lost eventually although by the time the Supreme Court declined to reverse a lower court decision Microsoft had taken over the spreadsheet market with Excel. The Lotus suit was over copyright, not patents although there are some similarities to the Apple vs. Samsung case. Among the things Apple has patents on are a method of zooming in by tapping the screen and an interesting way of moving back to the top of the screen. The thing that would probably strike most programmers here is that moving around on a screen is one of those tasks that can be performed in a wide variety of ways. It depends on the operating system and the hardware, but there are few programming tasks that have a single best solution. If it were up to me, I’d need to see proof that Samsung implemented the patented features exactly the same way that Apple did. I’d be very surprised if that were true. Speaking more generally, I think software patents do more harm than good. I can’t think of any sensible reason to prevent people from developing a different way of doing something even if the result looks the same on the screen. If a company copies another’s original software exactly, that’s wrong. If a company develops a technique that produces a similar result on the screen but works differently from another’s, that’s implementation of an idea. As I said above, I’m not an intellectual property attorney. I’m just a programmer.